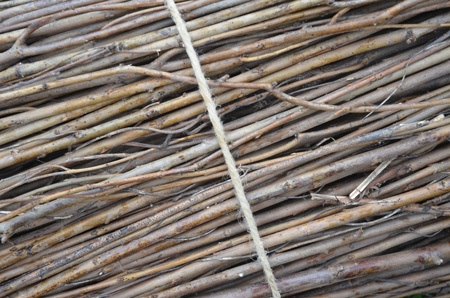 Willow faggots and fascines are a natural, environmentally sound product that have a multitude of uses including reducing soil erosion, river bank stabilisation, coir roll protection, spillway and shoreline protection. They are easy to install and are a long lasting solution. Faggots and fascines are tight bundles of small diameter willow bound together, and are particularly effective at providing protection to vulnerable river bank areas. 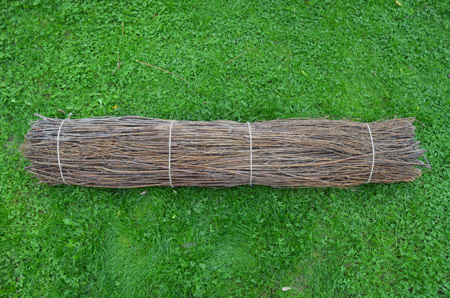 Multiple faggots can be installed with willow stakes to form a mattress which helps to offer protection on steep river banks and collect sediment in lower areas. We offer both live and seasoned stakes or pins for this use. Once used as a fuel, faggots are now primarily used for river bank stabilisation work as part of bunds, revetments or mattresses. Faggots slow the flow of the water, allowing silt to build up and therefore helping to prevent or reverse the effects of erosion. 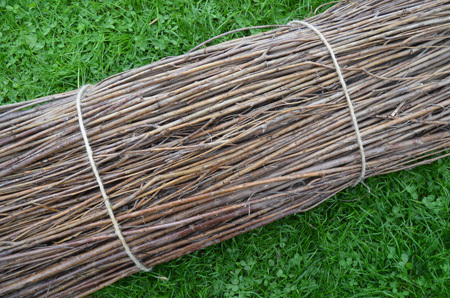 The faggots and fascines we produce are all made from our own willow grown in a sustainable manner on the Somerset Levels. The main variety we use is hybrid red, which came about due to a cross between Salix Caprea, Cinera, and Caladendron. The result of this was then crossed with Viminalis. We use this because Cinera and Caladendron are more tolerant to different soil types and are disease resistant. This type of willow is not as vigorous as Viminalis on its own. Faggots can be made from either Viminalis, Hybrid Red or Flanders or a mix of all three. 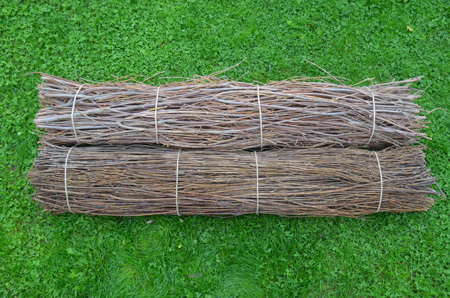 Faggots & fascines can be supplied in either course or fine willow, green or dried willow, and in lengths of 2 metres, 2.5 metres or 3 metres. As standard we make them to 300mm in diameter. Our Standard faggots are 2 metres long, 300mm diameter, and are priced at £10.00 + VAT each for a small quantity, e.g. 24 on a double pallet. Live stakes are generally 50mm in diameter and at 1 metre are 75p + VAT per stake. If you require these to be 'pointed out' then they would be 90p + VAT per stake. The variety of these would be Flanders (Triandra). We can also provide spiling material for weaving in riverbank stabilisation projects. 24 x 2m faggots would fit on a double pallet, and carriage would be approximately £100 to £120 + VAT on a three day service, depending on where they are being delivered. Please contact us for current stock levels, lead times for bespoke orders and accurate carriage costs to your particular location.